I went on a short vacation to southern New Mexico For Columbus Day weekend. Aside from the region’s great weather in this season, that was one of only two weekends per year when the Trinity site (see last week’s blog) is open to visitors. 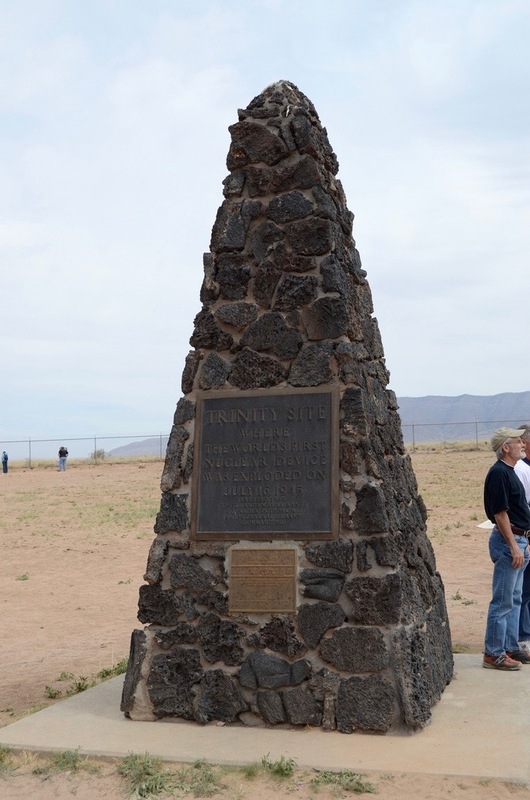 The photograph above shows the monument to the site of the first ever test of a nuclear weapon, performed on July 16, 1945. The site has now become a popular tourist attraction. The background radiation is about 10% higher than that of the rest of New Mexico; it’s considered to be safe so long as visitors limit their trips to one or two hours. Meanwhile, the background radiation in Hiroshima and Nagasaki today is about the same as the global average. We teach a course at my school based on Richard Rhodes’ book, The Making of the Atomic Bomb and I wanted to be up to date on the topic. I am scheduled to give a talk at a Sigma Xi meeting in San Francisco on the “Global Parameterization of Climate Change Indicators,” as they relate to the Anthropocene. My visit to New Mexico took place before the publication of the latest IPCC report but – as I mentioned last week – the AWG is working to define the beginning of the new epoch to coincide with the nuclear arms testing that took place in the middle of the last century. I thought that it would be appropriate to reduce that boundary to a single point in time and space: the first nuclear test at Trinity. Table 1 shows the major anthropogenic changes in some of the most important global indicators. Most of the values in the table were taken from the World Bank database. Given a lack of prior data, I used the earliest dates I could find for the “early” column. But the general trends are obvious: we live in a time of major change. Some of the best-preserved traces of the boundary are found in southern Scandinavia, where the transition from the latest glacial stage of the Pleistocene to the Holocene was accompanied by a marine transgression. These beds, south of Gothenburg, have been uplifted and are exposed at the surface. The boundary is dated around 10,300 ± 200 years BP (in radiocarbon years). This boundary marks the very beginning of warmer climates that occurred after the latest minor glacial advance in Scandinavia. This advance built the last Salpausselkä moraine, which corresponds in part to the Valders substage in North America. The subsequent warming trend was marked by the Finiglacial retreat in northern Scandinavia, the Ostendian (early Flandrian) marine transgression in northwestern Europe. One of the fascinating aspects of this business is that the way we mark the boundaries of geological epochs is targeted at future generations. In geological time, we measure the future in thousands of years. These markers will remain for a long time in the form of changes in the composition of rocks and the nature of fossils. But who will be here thousands of years from now to witness these changes? A few days ago I revisited the nuclear waste issue when I watched a PBS program. Most of the material was familiar however I almost fainted when I heard about an aspect about which I was totally ignorant – WIPP (Waste Isolation Pilot Plant). There is a site in Carlsbad, New Mexico that already has a license to store radioactive waste provided that one “minor” condition is fulfilled: Markers should be placed there that will be functional 10,000 years from now to warn whatever civilization may come next not to trespass on the site due to the risk of exposure to the deadly radiation. A large, multidisciplinary group was assembled there to try to figure out what kind of civilization will be around then so as to tailor make said warnings. We are already spending big money on a distant future 10,000 years from now to warn our descendants or extraterrestrials of damage that we are inflicting now. It’s not out of line to broaden the scope for damage that most of us consider existential within the lifespan of our grandchildren. Attempts to predict the nature of future generations over geological time are fascinating and few can actively refute such extrapolations. Attempts to make sure that the present version of humanity and our descendants remain part of such a future are much more difficult. This entry was posted in Anthropocene, Anthropogenic, Climate Change, IPCC and tagged Anthropocene, Anthropogenic, atomic, atomic bomb, AWG, boundary, carbon dating, Climate Change, Climate Change Denial, Climate Change Deniers, Climate Skeptics, CO2, CO2 emissions, define, definition, Electricity, Emissions, Energy, energy transition, Environment, epoch, Fossil Fuels, Future, GDP, geological age, geology, Glacier, Global Warming, greenhouse gas, Hiroshima, holocene, IPCC, Japan, Nagasaki, new mexico, Nuclear, nuclear bomb, nuclear testing, nuclear weapon, pleistocene, Population, radiation, radioactive, radioactive waste, Science, Sustainability, trinity, urbanization, waste, WIPP, yardstick. Bookmark the permalink.